Coming down to my last few craft beer club offerings, because I gave three to Brendan to review at some point. BA calls this a kolsch. If that's a kolsch, it's the darkest kolsch I've ever seen. Compare the photo to this. Or even this. 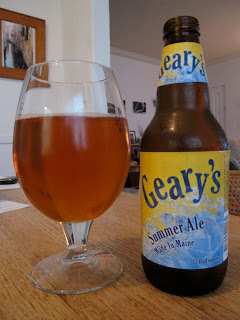 At least the Geary's website says it's 'similar to a German kolsch' without actually calling it a kolsch. Let's see how many more times I can say kolsch. Kolsch. Kolsch. I'm hoping if I keep saying it, this beer will actually turn into a kolsch. Kolsch. Kolsch? Dammit. The nose is pretty light, just a bit of musty malt and a twang of hops. Not much else there. The flavor's pretty much the same thing. It's got a nice light body and a relatively clean finish, but the excess of malt, combined with the fact that the malt is musty and stale, prevents this from being anywhere as delicious or easy-to-drink as a kolsch. Drinking one kolsch makes you want to drink eight more. Drinking this...well, in my case it makes me want to drink something else. Considering that my ideal summer beer is something like Nelson, or at the very least Franziskaner, that's not really any surprise.